Micron has made quite a name with their D9 chips in the overclocking community -- and OCZ's name is quite strong in the memory market as well. However, a big name combination does not necessarily mean big price with recent DDR2 price drops. 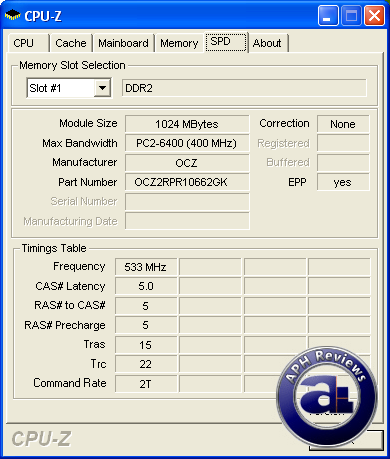 Complete with Micron D9 ICs, the OCZ Reaper HPC PC2-8500 2x1GB dual channel kit will take voltages up to 2.35V and still remain under warranty. Heat is not an issue, thanks to its full circuit copper heatpipes. For this reason, we expect a load of unspecified performance right off the bat. How well does these RAM step up? Let's have a close look at these memory modules today and, we'll take it from our benchmarks as well as the overclocking results. Our review unit of the OCZ Reaper HPC PC2-8500 dual channel kit came from OCZ's office in Sunnyvale, California using FedEx International Priority. As usual from OCZ, the rest of the room in the FedEx box is filled with packing peanuts to ensure our evaluation units arrive in undamaged, working condition. Also as expected, the packaging is in standard OCZ RAM format -- a clear plastic pack enclosed by four mini-blisters on the side; with two friction buttons at the top for easy opening. The RAM modules are placed one above another in relative; but it is surprisingly light and thin with its heatsink. It's a great idea to show off its massive heatsink though -- of course, referring to its height. The color scheme is quite interesting though. It certainly denotes a sense of 'Halloween feel' with its orange and black color scheme; including elements put forth by font used on the word 'Reaper'. Removing the plastic packaging and flipping the description sheet around, reveals the heat dissipation implementation of the OCZ Reaper HPC ("Heat Pipe Conduct", as OCZ calls it) heatsink. Heatpipes are immensely popular with computer components nowadays; since they require absolutely no maintenance and an effective method of removing heat in a closed system. We'll go over this shortly. CPU-Z correctly detected its EPP support, for 6-series NVIDIA chipsets.